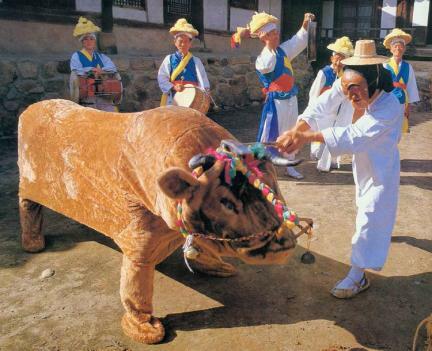 별신굿이란 3년, 5년 혹은 10년마다 마을의 수호신인 성황(서낭)님에게 마을의 평화와 농사의 풍년을 기원하는 굿을 말한다. 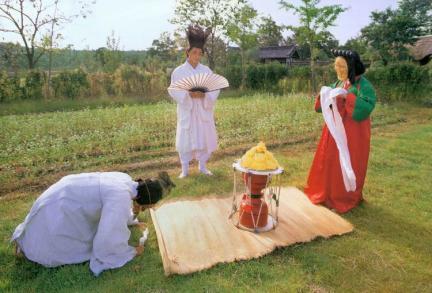 경북 안동 하회마을에서는 약 500년 전부터 10년에 한번 섣달 보름날(12월 15일)이나 특별한 일이 있을 때 무진생(戊辰生) 성황님에게 별신굿을 해왔으며 굿과 더불어 성황님을 즐겁게 해드리기 위하여 탈놀이를 하였다. 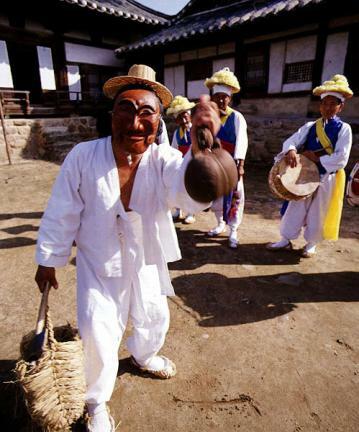 하회별신굿탈놀이는 각시의 무동마당·주지마당·백정마당·할미마당·파계승마당·양반과 선비마당·혼례마당·신방마당의 8마당으로 구성되어 있다. 놀이를 시작하기 전 대내림을 하는데, 정월 초이튿날 아침 성황당에 올라가 당방울이 달린 내림대를 잡고 성황신을 내리면 당방울을 성황대에 옮겨 달고 산에서 내려온다. 성황대와 내림대를 동사 처마에 기대어 세우면 비로소 놀이가 시작된다. 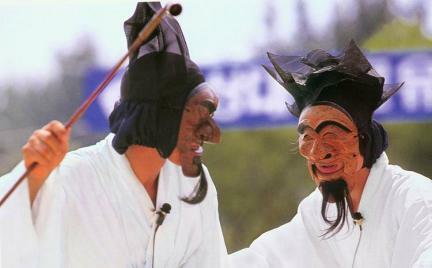 등장인물로는 주지승·각시·중·양반·선비·초랭이·이매·부네·백정·할미 등이 있다. 파계승에 대한 비웃음과 양반에 대한 신랄한 풍자·해학 등을 내용으로 하고 있다. 하회별신굿탈놀이는 제사의식적인 성격을 띠고 있다. 특히 각시탈은 성황신을 대신한다고 믿어 별신굿 외에는 볼 수 없고, 부득이 꺼내볼 때는 반드시 제사를 지내야 한다. 놀이에 사용되는 탈은 주지탈 등을 포함하여 모두 10종 11개로 오리나무로 만들었으며 옻칠과 안료를 두세겹 칠하여 색조의 강도를 높였는데, 원본은 1964년 하회탈 및 병산탈(국보 제121호)로 지정되었다. 탈놀이의 반주는 꽹과리가 중심이 되는 풍물꾼이 하며 즉흥적이고 일상적인 동작에 약간의 율동을 섞은 춤사위로 이루어진다. 하회별신굿탈놀이는 탈을 태우며 즐기는 뒷풀이가 없는 것이 특징이며, 우리나라 가면극의 발생과 기원을 밝히는데 귀중한 자료로서 가치를 지니고 있다. 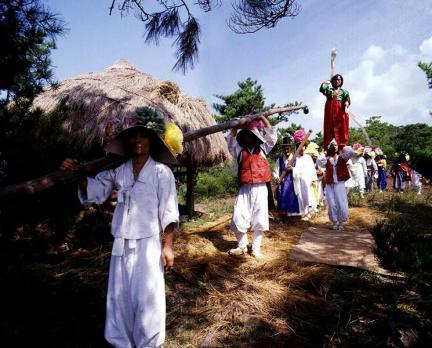 Byeolsingut refers to a ritual held to pray to the village guardian for the peace of the village and good crop every three or five or ten years. 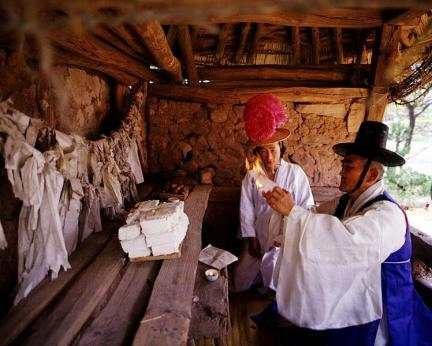 In Hahoe Village in Andong, the villagers have performed this ritual for about 500 years, once (December 15) every 10 years or on special occasions. The rite is composed of eight acts, i.e. 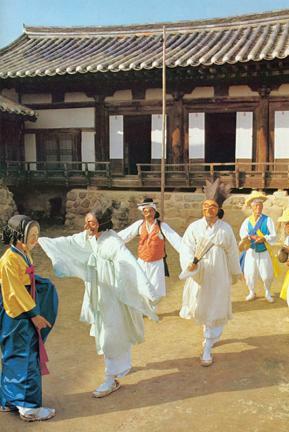 Gaksiui Mudong Madang (Boy Dancer Act), Juji Madang (Head Monk Act), Baekjeong Madang (Butcher Act), Halmi Madang (Old Woman Act), Pagyeseung Madang (Depraved Monk Act), Yangban Seonbi Madang (Act of Nobleman and Scholar), Hollye Madang (Wedding) Act, and Sinbang Madang (The First Night Act). 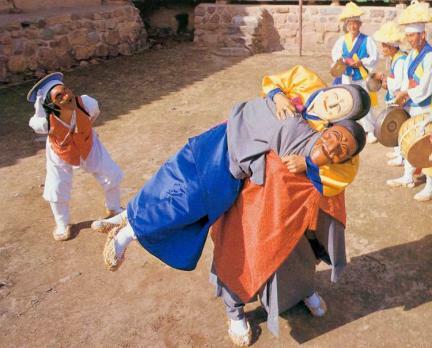 The play includes ridicule of depraved monks, satires about nobles, and other humorous content. 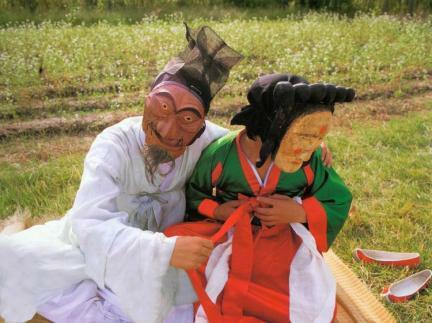 It is believed that the mask for a newly-wed woman symbolizes the village guardian. 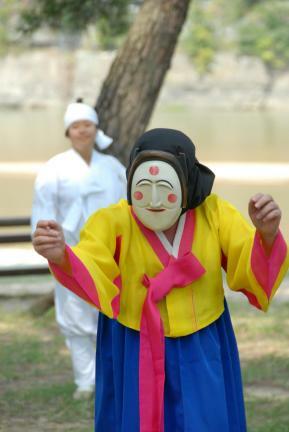 Thus, the mask is shown to people only during Byeolsingut. 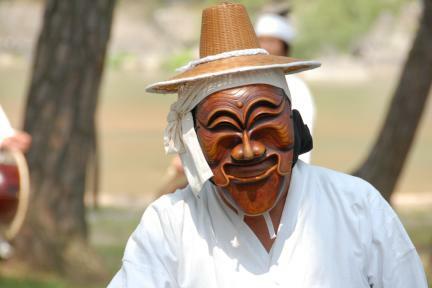 A total of eleven masks in ten types made of alder wood are used for the play. 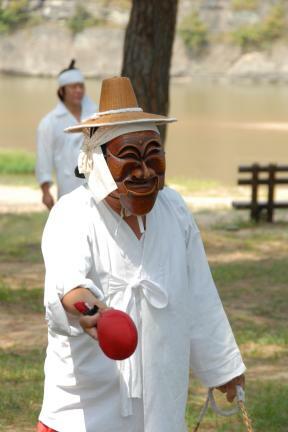 The original masks were designated as National Treasure No. 121 in 1964. 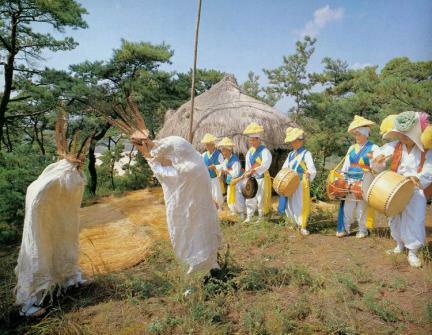 The play is performed to the accompaniment of pungmulkkun (a farmer’s music band composed of kkwaenggwari (small gong), taepyeongso (conical wooden oboe), sogo (small drums), buk (drums), janggo (hourglass-shaped drum), and jing (large gong). 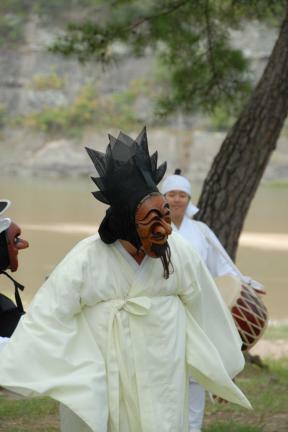 This play performed in Hahoe ends without the post-event rite of burning the masks used as in mask play events that are held elsewhere. 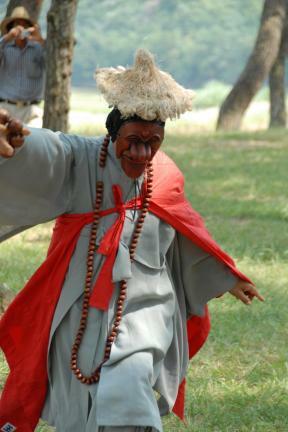 It is regarded as a valuable source of material in relation to how mask plays were performed in the country.